Model 85 cast iron and bronze Y strainers handle aggressive industrial and commercial applications. Cast iron models are available in pipelines up to 10 in. in ratings from 200 to 500 psi, with threaded or flanged piping connections. Bronze strainers in pipeline sizes to 6 in., are available with threaded, flanged or solder-end connections, and are rated up to 225 psi. Strainers come with one stainless steel strainer screen. Hayward Industrial Products has introduced a new line of cost effective, heavy duty cast iron and bronze Y strainers for liquid, gas or steam services. These new strainers, designed for aggressive industrial and commercial applications, are now available from Hayward stocking distributors. Cast iron Model 85 Y strainers are available in pipeline sizes up to 10" in ratings from 200 to 500 psi. Threaded or flanged piping connections are offered. Model 85 cast bronze Y strainers, available in pipeline sizes to 6", are available with threaded, flanged or solder-end connections and are rated up to 225 psi. The strainers come standard with one stainless steel strainer screen and have compressed, non-asbestos synthetic fiber gaskets. 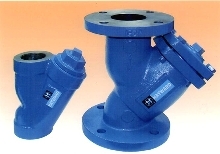 Both the bronze and cast iron Y strainers are offered with threaded or bolted covers. The Hayward Y strainers meet the requirements of virtually any Y strainer application. Additionally, Hayward Model 85 cast iron and cast bronze Y strainers can be ordered with a wide range of perforation and mesh strainer screen sizes. Users can choose from 1/32" all the way up to 1/2" perforated screens and from 20 to 400 mesh. Monel strainer screens are also available. These new cast iron and bronze Y strainers, along with Hayward's existing line of carbon steel and stainless steel Y strainers, give system designers and operators an extensive selection of high quality, economical Y strainers for a variety of applications. Hayward Y strainers are available worldwide through stocking distributors.